Late ‘80s was a very unsettling time for Foreigner. After e series of smashingly successful albums, including “4” (1981) and “Agent Provocateur” (1984), things needed to cool down for a second before moving on to the next step. Lou Gramm and Mick Jones took some time off to explore their individual artistic strengths. That’s when Lou released the album I will be talking about – “Ready or Not”. I cannot understand the pressures of the business; I can only imagine how turbulent and stressful it was for Foreigner to constantly be under the radar and asked when the band’s next big hit will be played on the radio. On top of it all, there always comes a time when egos, ideas and opinions clash, especially if you worked with someone for so many years. That’s why taking time apart and going on an adventure (in our case, releasing your first solo album) is totally justifiable. Nevertheless, after Lou Gramm finished with his debut and the promotional activities and concerts he did come back (along with Mick Jones) to record Foreigner’s sixth studio album, “Inside Information” (1987). Unfortunately, that great album, featuring classics like “Say You Will”, also became the last album to feature the ’80s winner line-up, making it the end of an iconic, historically relevant era of rock music. Gramm did come back in the early ’90s (“Mr. Moonlight”, 1994) but then departed again. Foreigner moved on without Lou, naturally. It’s a whole different topic whether there can be a Foreigner without Lou Gramm, though, but will save it for some other time. “Ready or Not” was released at the very beginning of 1987 and it definitely signaled the arrival of a strong (if not the strongest) year for rock music. Overall, the album did make quite the fuss – a top30 chart position in the USA, a #1 hit single (“Midnight Blue”), dozens of concerts and happy faces, etc. etc… No surprises there – “Ready or Not” is as good as you might expect it to be (we are talking about Lou Gramm after all). Numerous rock band vocalists of the era, including Peter Cetera (Chicago) and Steve Perry (Journey), for example, released solo albums so what Lou did wasn’t really that surprising. What also didn’t surprise fans was the commercial and critical triumph of the album. Lou Gramm and producer Pat Moran crafted some serious melodic rock magic and proved to be a winning team. The Foreigner vibe is still there – I mean come on, what did you expect? Lou was after all a huge part of Foreigner’s sound. Interestingly, though, there’s something unique and distinctive about “Ready or Not” which cannot be found on his previous work with the band. To me, it sounds a little bit more soulful and sincere, less sweet and even a bit edgier. One more thing that impressed me was the guitar work courtesy of Nils Lofgren who was like a breath of fresh air for the fans. My final verdict is that “Ready or Not” is a beautiful gift to anyone who loves and appreciates God-given talent and melodic rock, of course. Top notch production quality, superb guitar work and catchy, highly entertaining, full of life songs are some of the characteristics that make this album worthy of your time. In time, people forgot about it but I am here to remind you! One thing that truly frustrates me is that every time I have a conversation about the greatest hits of the ‘80s, songs like “Midnight Blue” or “Ready or Not” never get a mention. “Midnight Blue” is a fantastic pop/rock single which absolutely proved that Lou Gramm is more than fine on his own. The title track, “Ready or Not” is my personal favorite – those drum rhythms, vocal and melodic hooks took my breath away. Lou knows how to craft a beautiful ballad and he perfectly uses that gift of his on “Ready or Not As Well”; The stunning ballad “If I Don’t Have You” might as well be one of the most overlooked ballads of the era, despite its qualities. The excellent rockers “Heartache” and “Until I Make You Mine” are just a couple of the other tracks that back up my statement – “Ready or Not” is Lou Gramm’s purest manifestation of at his creative and artistic power and most certainly a turning point for his career. Don’t forget to play the songs! Don’t Forget to Subscribe to my Blog or Follow me on TWITTER! great post Velina! you’re right, this album and these songs always seem to get overlooked when people talk about the great music of the 80’s. this is one of my favourite albums from that time period. I was lucky enough to see Lou Gramm on the tour for this record back in the summer of 1988 when he opened for Steve Miller. fantastic live performer and one the best voices in rock! 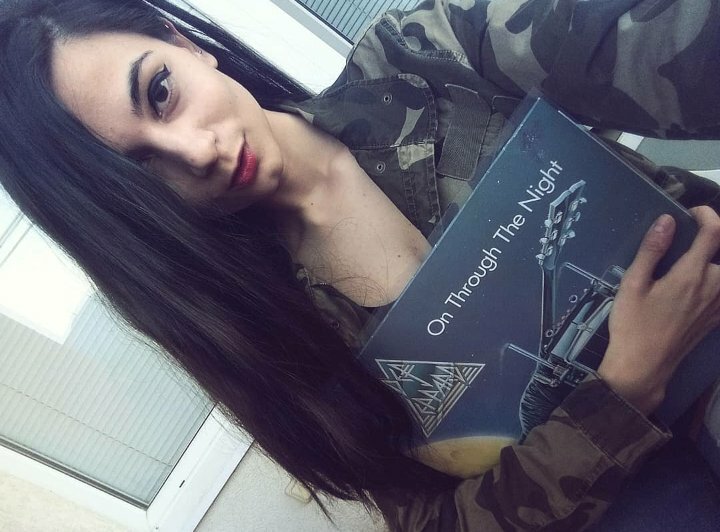 thanks for taking the time to share this great record with us!